Michael Caci's "GOD OF THE RING MADE MAN" Series Are Stunning; A Bold Conceptual, Allegorical, and Technical Accomplishment! Gallery Schedule: the Gallery will be open until 6:00 pm - 8 pm (later, if by appointment). This image of a seal ring, the inspiration for these two most recent iterations of the “GOD OF THE RING MADE MAN” Series, comes from a Mycenaean warrior’s grave discovered in an olive grove on the island of Crete in 2015. It wasn’t far from Nestor’s palace straight out of Homer’s great poem, “THE ILLIAD AND THE ODYSSEY”. And its central to the story behind my CORRIDA series in which I set to give voice to my thoughts on the rise and fall of cultural traditions. My imagination was captivated by the long tradition of the bull in art history; from the earliest images of bull jumping - as exemplified by the mosaic from Knossos – to the novel by Ernest Hemingway, “DEATH IN THE AFTERNOON”, or Pablo Picasso’s use of both the Minotaur - half man/half bull - and the bullfight itself, as the metaphor of ritualized masculinity and power. What strikes me most is the connection between magical thinking and the real “life and death” ritual surrounding the bull. And how all of this behavior, once ennobled in the theater of the corrida or bullfight, is now in its last active throes. There’s a sense of progress and loss as human civilization casts off vestiges of our frequently brutal and violent history, as embodied in the corrida, and evolves into the next phase of civilization. These works - often a year in the making - are created with that bridge between the past and present in their “DNA”. They are only made possible with the merging of traditional materials with digital technology…imported papers, oil paint on canvas, photography, dichroic film and glass, online photo appropriation, digital manipulation, and poured resin. Each work is like an archaeological unearthing of layer after layer of content and material. As my experimentation, it’s failures and successes in this alchemical medium has progressed, I’ve learned by the combining of certain materials within specific applications, to also manipulate light, enhancing further the image and therefore the viewers uniquely personal experience with the image. Michael Caci's GOD OF THE RING MADE MAN Series is the culmination of literally years of experimentation and vision. When first presented to me, I viewed it with no small degree of skepticism...A bullfighting theme? But as I became witness to Caci's vision made manifest in one work after another, I became convinced he was on to something. The "bullfight" was simply the metaphor for something much more culturally and psychologically complex; not to be interpreted literally. Much of each work's strength is attributable to Caci's technique. One hates to get too caught up in the technical attributes of a work in lieu of aesthetic, but in this case technical is what underscores and contributes to the aesthetic. 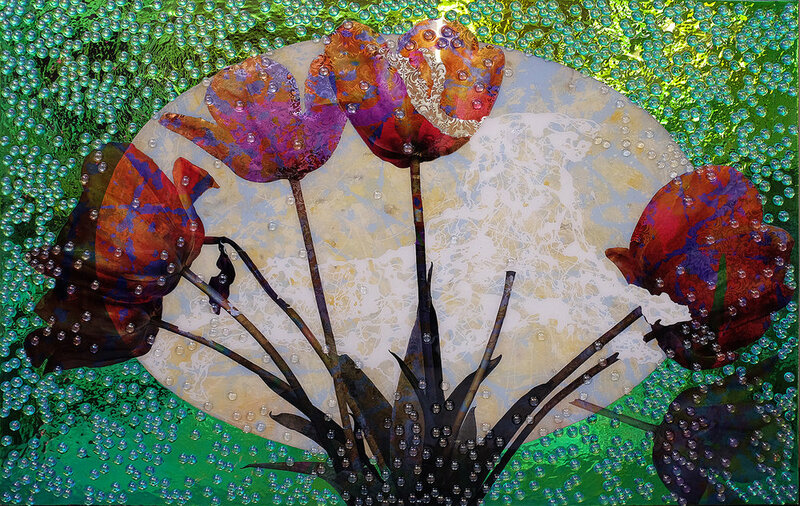 Using his own photography and photos appropriated from the internet, digitally manipulated for color and scale, the photos are printed on clear, transparent sheets, and layered over his painted canvas and/or handmade papers or reflective foils, each layer of material sandwiched within clear acrylic resin and then finished with a final layer of clear resin. Each work, from concept to the final resin finish, can take up to a year to complete. Viewing these as you are right now - on your computer or phone's screen - does them NO justice. These are works which need to be seen in person to truly appreciate their visual depth and interplay of light and bold, electric color.